PC Dave Wardell and his now-retired police dog Finn (pictured) were both stabbed whilst chasing a suspect in October 2016. The Animal Welfare (Service Animals) Bill has been given Royal Assent, meaning that it will now be an offence to harm a service animal in the line of duty. The Bill, more commonly known as Finn’s Law, received Royal Assent in the House of Lords last night (8 April). It will now be known as the ‘Animal Welfare (Service Animals) Act 2019. 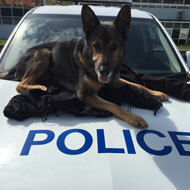 It comes after a campaign led by PC Dave Wardell and his now-retired police dog Finn, who were both stabbed whilst chasing a robbery suspect in October 2016. The defendant was charged with actual bodily harm for injuring the handler, but only criminal damage for harming Finn. Thanks to the tireless efforts of Dave Wardell and campaigners, the government introduced new sentencing guidelines for attacks on police animals. Then, in 2018, the government announced its support for Finn's Law and published a new Bill that would give service animals greater protection. Upon hearing the Bill had received Royal Assent, PC Dave Wardell Tweeted: “What absolutely amazing news to wake up to #Finnslaw has got Royal Assent. What an amazing legacy.